VIDEO: This Legend Releases Official “Holiday From Crazy” Music Video! The pop-punk clan from California, This Legend, made their debut on June 10, 2014 with Fuse, announcing LP and Ben Harper, two original Yellowcard members had reconnected after nearly a decade of not playing music together, sign to Cyber Tracks (label owned and operated by El Hefe of NOFX and wife Jen Abeyta), and hit the studio. The band recorded their 12-track debut with Sam Pura (State Champs, Basement) at The Panda Studios which features singles “Life Pushes Hard” and “Lyrics From My Pen.” The band just wrapped a thrilling full US and Canadian tour with Lagwagon and today, December 15th, they are excited to partner with BlankTV for the official music video release of “Holiday From Crazy” (directed by Travis Mauck and produced by Travis Dixon). Last month the band partnered with Red Bull to unveil an exclusive stream of their album and announce an official pre-order for their vinyl via the Cyber Tracks website. Red Bull coined the album and technique by noting it is, “Filled with tight tracks driven by LP’s trademark frenetic drumming, Harper’s searing guitar playing and the empowering lyrics, It’s In The Streets will definitely charge you up.” Fans interested in pre-ordering It’s In The Streets on vinyl can head over to CyberTracks.com for more information/details. Check out the music video below! Remember to grab their album from iTunes or pre-order a vinyl copy now! This Legend Unveils Second Single “Life Pushes Hard” From New Album — Listen Now! From their forthcoming album due out this fall, This Legend excitedly released a second single “Life Pushes Hard” written by lead singer Chris Castillo and premiering with Alternative Press. Chris had written the song in hopes of helping fans through difficult times in life. “Life Pushes Hard” comes after their debut hit “Lyrics With My Pen” which premiered exclusively with Team Rock. 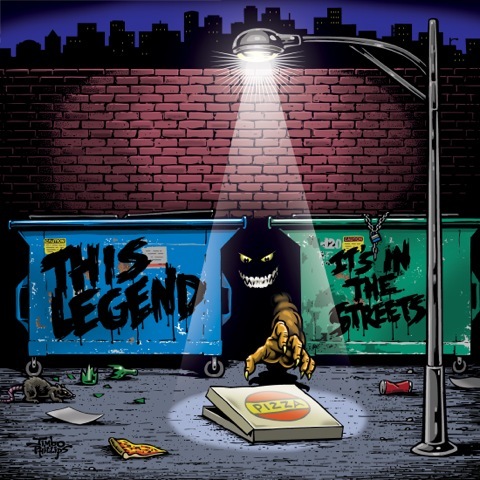 More details about their debut album are set to be released next week for fans along with more music to give pop-punk fans a glimpse of who This Legend really is. Until then, fans can get exclusive details from This Legend about their debut album being released on Cyber Tracks, an LA record label, with idobi radio as well as checking out dates and details for their upcoming The Road To Florida Tour with Lagwagon happening this coming fall! Make sure you have a listen to “Life Pushes Hard” by This Legend below! Moreover, the band is excited to announce an upcoming full-US and Canadian tour with Lagwagon. Kicking off at the House of Blues in San Diego, the 4-piece will travel up to Canada, the Midwest and complete the tour through the Northeast this November and December. The tour will follow a slew of headlining shows on the West Coastin Tour and The Road To Florida Tour (see dates below). In addition, the band has been added to the 9/28 Rise To The Fall 2014 Tour opening for Authority Zero at the DNA Lounge in San Francisco. This Legend Announces Headlining September Fall Tour — Check Out The Details! In early June, FUSE exclusively announced the debut of This Legend consisting of former Yellowcard members Longineu Parsons III and Ben Harper, Chris Castillo (Stanley and the Search), and Steven Neufeld (Hey Mike!). The band also signed to Cyber Tracks, an LA based record label owned by El Hefe (guitarist of NOFX) and wife Jen Abeyta. 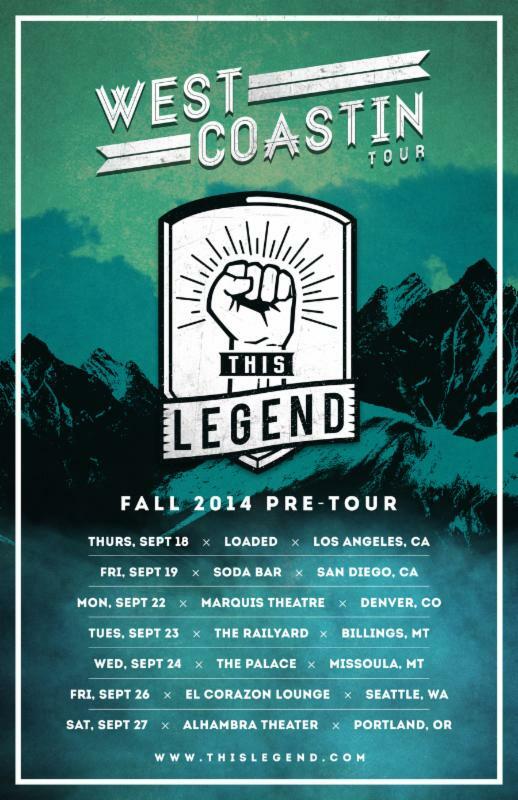 Today, This Legend is happy to announce their first headlining tour this September, the West Coastin Tour, kicking off at Loaded in Los Angeles on September 18th. The band is ecstatic to give fans a sneak peek into their debut album set for release late this fall. Just last month the band finished recording at the Panda Studios with heavy-hitting producer, Sam Pura (The Story So Far, State Champs, Basement). Former Yellowcard members Longineu Parsons III and Ben Harper have re-united and formed a new pop-punk band. The new collaboration will be called This Legend featuring members LP, Ben Harper, Chris Castillo (Stanley and the Search), and Steven Neufeld (Hey Mike!). The band has signed to Cyber Tracks, an LA based record label owned by El Hefe (guitarist of NOFX) and wife Jen Abeyta. Their debut album will be produced by Sam Pura (The Story So Far, State Champs) and is expected for release this October. Stay tuned for new music to come soon. For more information on This Legend go here. It’s no surprise that creating a band takes a lot of work, but coming out of previously successful bands and having to start from scratch takes honest passion. For the first time in over ten years, best friends Longineu Parsons III “LP” and Ben Harper, both formerly of Yellowcard, re-united in May, 2014. They have enlisted Chris Castillo of ‘Stanley and the Search’ and Steven Neufeld of ‘HeyMike!’ to form This Legend. With a world renowned trumpet player as a dad, it was inevitable that LP would become an unstoppable musician. Starting at the tender age of two, LP quickly picked up the drums with the help of professional drum instructors Max Roach and Art Blakey. Fast forward several years, LP would meet soon-to-be best friend and guitarist Ben Harper at Douglas Anderson School of The Arts. The two formed what would become the well known pop-punk band Yellowcard and toured the world together for many years. Harper would later leave Yellowcard to continue his musical endeavors with his self-founded label, Takeover Records. 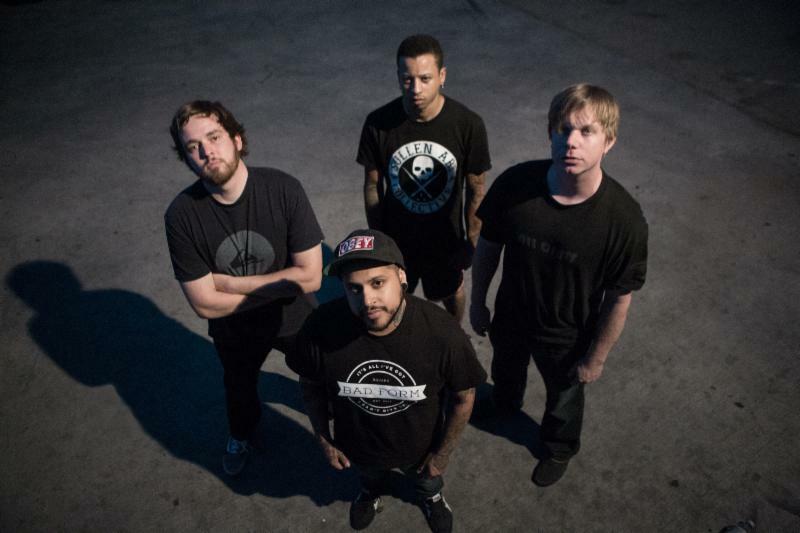 One of his first signings would be HeyMike!, a punk band from Camarillo, CA. The band saw moderate success throughout the mid-2000’s with the help of Harper’s guidance. Harper and Neufeld, the band’s singer/guitarist, became close friends during their time working together. Also spawning from the local scene, Castillo (having previously played in several San Gabriel Valley bands including ‘Stanley and the Search’) caught the attention of NOFX guitarist El Hefe and wife Jen Abeyta, as a significantly talented singer/songwriter.